When we meet the Page of Pentacles, we see immediately that she is one that is ambitious and focused. She is protected, nourished, provided for by the suit whose name she bears. Guided by it, she is deeply tied to the earth, nature, and all of its gifts. She cherishes the body, for it too is something which is a manifestation of her element. Her diligence, ambition and loyalty drives her to quickly make plans for the future - for it is there where her focus lies. Guided by the pentacles, she is deeply tied to the earth, nature, and all of its gifts. She cherishes the body, for it too is something which is a manifestation of her element. When you meet her, she may be the bearer of news connected to all earthly and material matters. When you hear her message, be inspired as she is - lay down the foundations to follow your ambitions. Generally, the Page of pentacles refers to the kind of energy that you need to complete all that is needed for your work. It may point to the determination, focus and the ability to stick with a particular task no matter how boring it may seem. In terms of work, the Page of Pentacles may signify that there are a lot of tasks you are responsible for, but your time to complete them is much too limited. This is not the time to feel stressed and overwhelmed. Assistance will be there for you, you just have to ask for it. In relation to finances, the Page of Pentacles can refer to the reward for your hard work. For those who are investing their hard–earned money, this is not the perfect time for you to take the risk. Invest your money in a safe and traditional way - the diligence will pay you back. If you are currently experiencing a health issue, this problem may be the result of the continuous neglect. Let a professional make sure that this is not the case. When the Page of Pentacles card appears reversed, it may point to your lack of focus. There is a possibility that you are being distracted with lots of things. Try to borrow the talents of this page and focus your mind before moving on the next thing. It may also indicate that you need to give yourself a break to refresh your mind. With regards to work, the Page of Pentacles reversed may signify that you are currently feeling overwhelmed due to the heavy demands in your workplace. Remember that it is always better to ask for assistance and complete the work rather than to try to finish it all by yourself and end up failing to do so. In terms of love, you are probably in a solid and steady romantic relationship, but perhaps someone else has caught your interest lately. 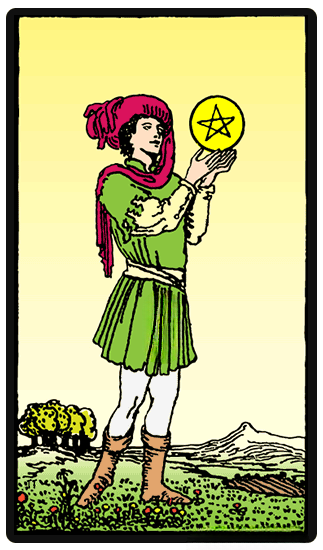 When it comes to your finances, the Page of Pentacles reversed may refer to that urge to play and gamble. Be sure to stay responsible and be in control of your actions. In terms of health, do your best to stay away from dangerous activities.